Japanese car maker Nissan has a history of embracing advanced and sometimes unconventional vehicle tech, but its latest prototype could be the most unusual yet: a sweat-sensing material that warns drivers when they’re dehydrated. Nissan joined forces with Dutch design company Droog for the fabric, which is aptly named SOAK. To demonstrate its abilities, SOAK was applied to the car seats and steering wheel of a Nissan Juke vehicle. If you’re nicely hydrated, the color stays blue, but if it detects high levels of salt in perspiration, suggesting dehydration, the material will turn yellow. While this might sound a little pointless, Nissan has cited a 2015 study by Loughborough University in the UK. Funded by the European Hydration Institute, the experiment found that driving while dehydrated can be as dangerous as driving under the influence of alcohol, due to slower reaction times and less alertness. Researchers also discovered that people who only consumed just 25ml of water per hour made double the number of driving mistakes than those who were well hydrated. 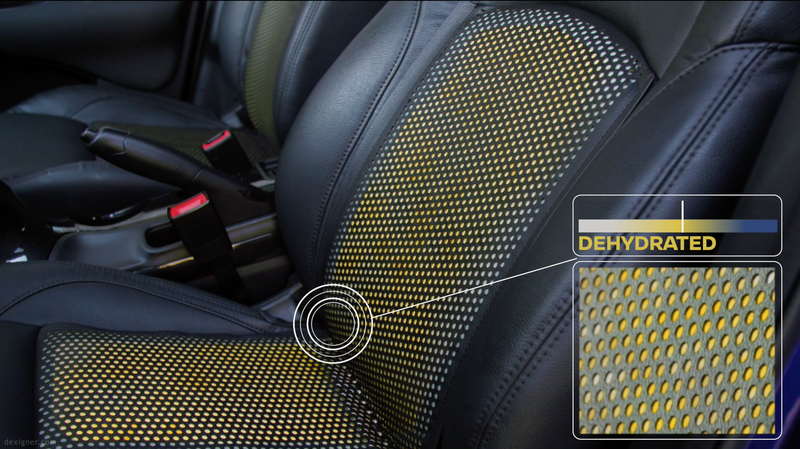 Despite SOAK’s benefits, it’s unclear just how many drivers would be happy to sit on sweat-detecting fabric — and whether they’d even heed the warnings — which could explain why Nissan isn’t yet offering it as an option in the Juke. Earlier this year, Nissan revealed the Signal Shield, a compartment built into the Juke’s armrest that blocks phone signals using principles based on a Faraday cage.